This is ridiculous! The first problem with this sign is that it is inaccurate by suggesting that only Muslims are suicide bombers. In fact, the first Palestinian suicide bomber was a Christian (source: a 2002 article by Zaki Badawi in New Scientist). And even if the sign was true it does not mean that Islam is inherently bad just because suicide bombers are Muslims. This would be like saying that Christianity is wrong just because of the Crusades, Inquisition, or televangelist scandals. The other even bigger problem is that signs like this are likely only to drive people away. How do we expect people to accept the love of Jesus if all we show them is hate? If it were not so sad it would be pretty ironic that the name of the church is "Good News." Why not just stick with the Good News? If this is what love and Good News looks like, then this is a bad sign for us all. Thanks to Kevin Bussey for pointing out this story. He rightly contends that the sign is "[n]othing like being 'salt and light.'" We "Christian" drop the bombs so there is one less dead. Diane: Thanks for the comment. You make a good (but sad) point. Just because Christians are not usually suicide bombers, that does not mean that Christians are not killing people. 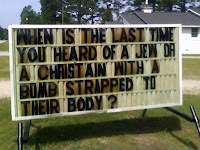 When someone passes along a message such as that on the sign to me, I remind them that the first recorded suicide attack I'm aware of, was the story of Samson. I do this not to justify suicide attacks, but to remind that self-righteous hypocrisy is not a Christian value. I'm reviewing your book for S & H. Good stuff! Stan: You are correct. Self-righteous hypocrisy should have no place among Christians. Kevin: Glad you’re liking it! I thought you probably would since you obviously have a great sense of humor.